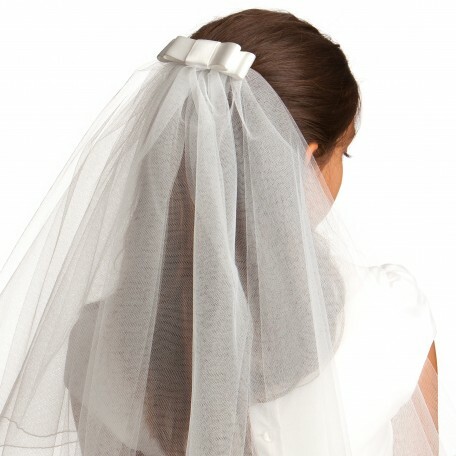 If the dress calls for a quiet and elegant First Communion headpiece, this Jackie Satin Bow Communion Veil fits the bill. This piece works beautifully with many dresses. The structured 1" wide luminous drape satin bow measures 4" across on a 2 3/4" French automatic clip. Permanent two-tiered (22"/24" long, 72" wide) pencil (merrow) edged veil attached. This is a classic!